When we first release the V1 of the Mini Ultra Pro, we were very surprised that people actually like the design very much. On top of that, we received a lot of suggestions on future features from our awesome customers. We take all the suggestions seriously and incorporate most of them into the new revision of the Mini Ultra Pro. Here’s the list of the changes in the new revision. 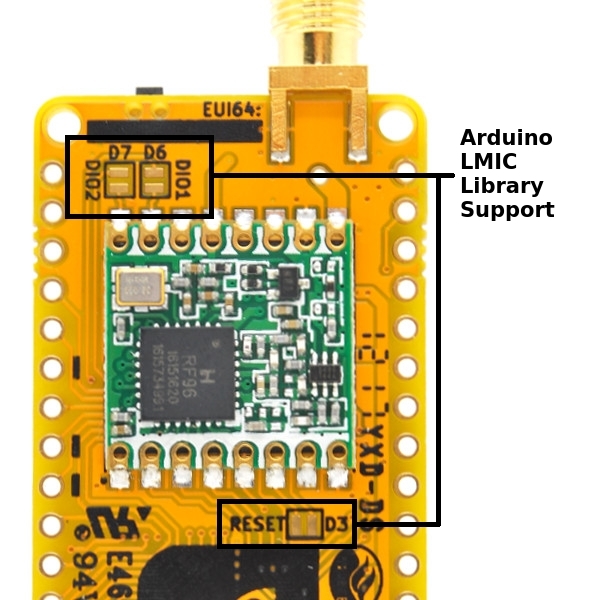 The Arduino-LMIC library enables the use any Arduino compatible board paired with a RFM95W radio module to run a full LoRaWAN stack. This allows the board to connect to a LoRaWAN network such as the The Things Network (TTN). 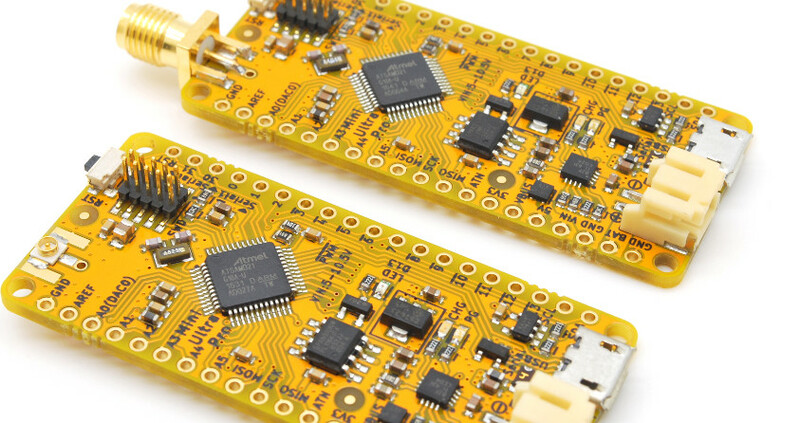 But, in order to use the library, a few more pins on the RFM95W radio modules needs to be connected to the ATSAMD21G18A microcontroller. 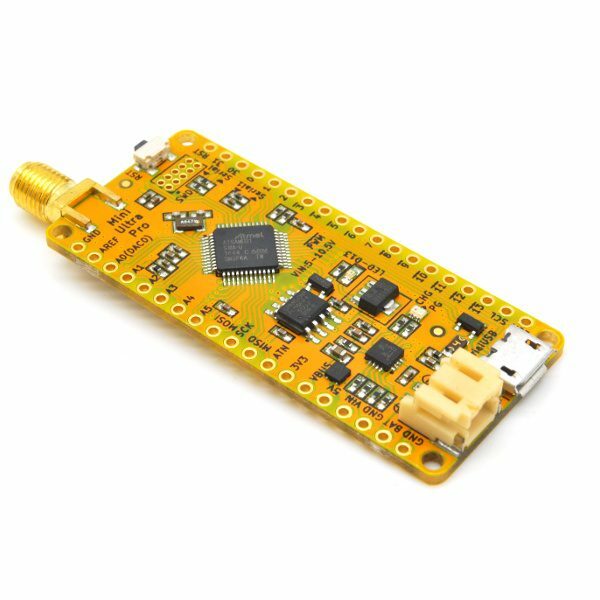 This includes the DIO1 pin (if running in either LoRa & FSK mode), DIO2 pin (if running in FSK mode), and an optional RESET pin. We provided solder jumpers to allow user to connect them when using the library. On top of that, the board still runs the awesome multi platform RadioHead Packet Radio library without any of the solder jumpers close. Besides the extra pin connection on the radio module, in order to access a LoRaWAN network a node requires a unique 64-bit (8-byte) address known as DevEUI in LoRaWAN network. This global identifier MAC address is provided by the 24AA02E64 chip from Microchip. 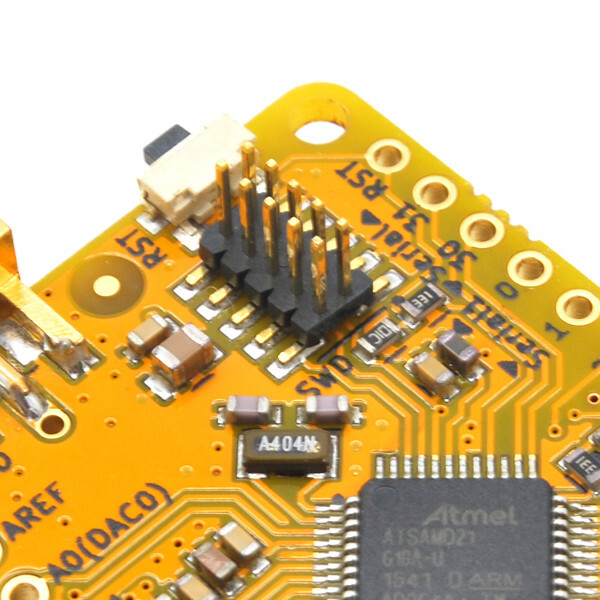 The chip can be accessed easily through I2C interface (Wire library on Arduino). We also added 2 pull-up resistor usually employed on I2C bus. We added option to use u.FL on top of the existing SMA connector. This is very useful in the case where space is limited and you wanted to mount the antenna on the wall of an enclosure. 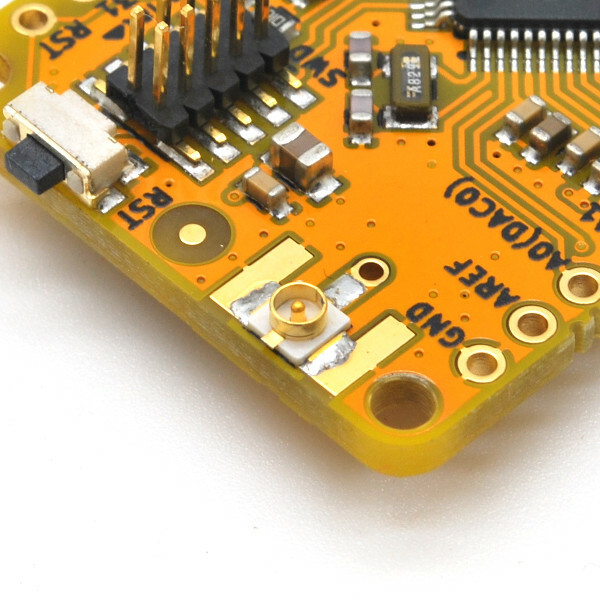 The u.FL connector can be removed easily with a soldering iron to use a 1/4 wave wire antenna solder to a pad hole provided on the board. On the 1st revision, we used a dual common anode LED for the power good (PG) charging (CHG) process indication. At times, it might be less clear which indicator is being turned on especially under direct sunlight. We decided to use 2 separate LED (red and green) in the new revision for better clarity. We upped the size of the decoupling capacitor on the radio module to 47μF from 4.7μF on top of the smaller 0.1μF capacitors. 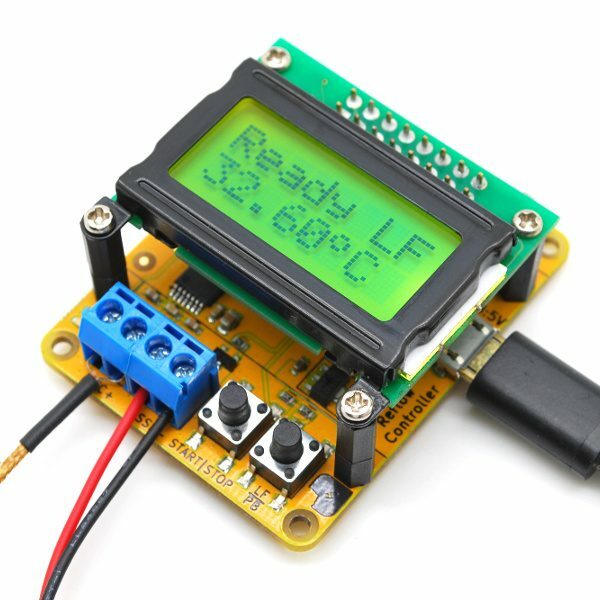 This will provide a better performance especially when the radio module is transmitting. We provided through hole pads for the ARM Cortex SWD interface in the 1st revision. The tiny 1.27mm pitch connector can be very hard to solder especially when you are on a high caffeine diet. 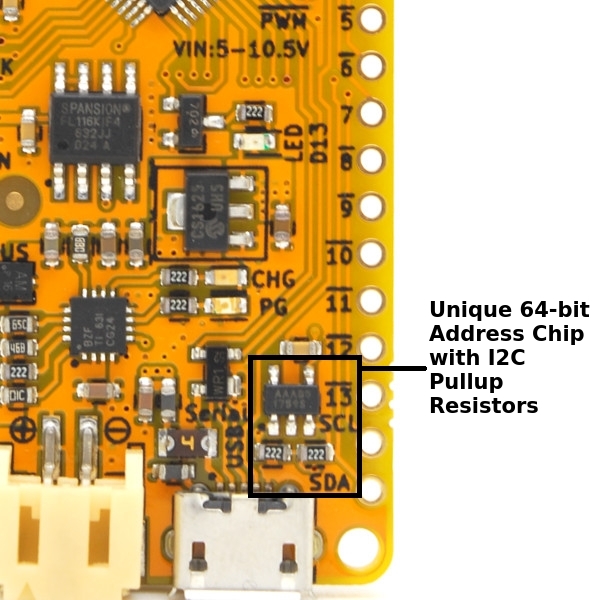 We added a SMT version of the connector and mounted them on the board so you don’t have to solder them on your own. We have gone back to use 0603 passive components with smaller solder pads. This amazingly improved our production yield close to 100%. All our inventory is filled with mostly 0603 sized components (except bulkier and bigger values of capacitors) and this allows us to further streamline component usage across different designs. To the all guys that has been generous and kind to provide awesome feedback, thank you very much. The changes on the board is the outcome of these awesome suggestions and feedback. Despite all the changes, the Mini Ultra Pro is still ultra low power like the 1st revision at 20μA during sleep mode. 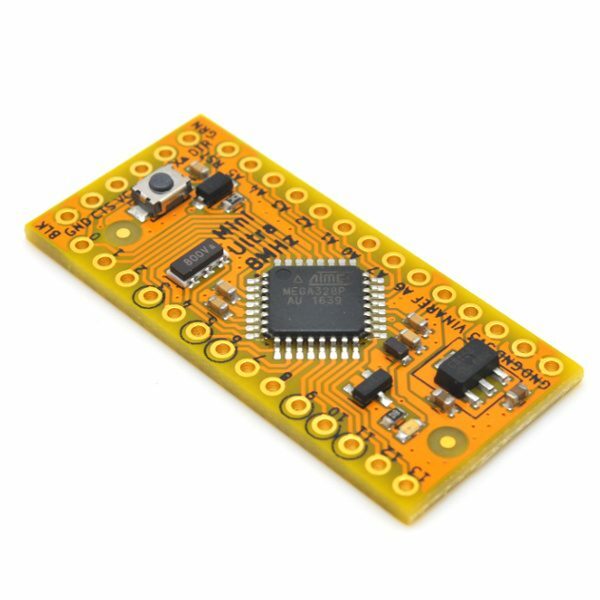 We’ll be writing a few more guides especially on how to use the Arduino LMIC Library with the Mini Ultra Pro. 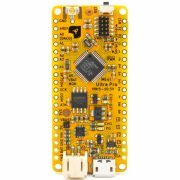 Some add-on board for Mini Ultra Pro is coming along as well!